Wild Ginger has been a star Seattle restaurant since the late 90's. My first experience had been when my brother got married. We went to the original location with our extended family for the rehearsal dinner. The next time I went back the restaurant had moved to a larger location with much more upscale design. This time I am at the brand new second location in Bellevue, WA. My father remembered the rehearsal dinner and requested that we go there for dinner. So it definitely made an impression if he's remembering a meal from ten years ago. This new location opened in September '09. It looks very similar in design to the downtown Seattle location, including being two-story. There is a large satay bar downstairs and a small private bar area. I thought it was odd that the bar was downstairs, so far from the entrance and tucked away in the back. 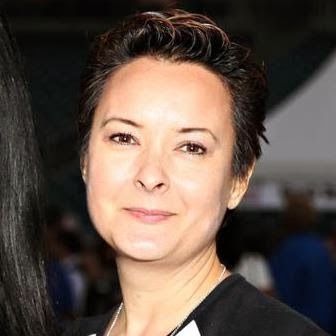 Bar business is usually so important for sales, so why is it so hidden? While I was in the restroom I was fascinated by the Dyson Airblade hand dryers in the bathroom. It was the most effective air dryer I've ever used. People generally reach for the paper towels because they hate to wait for the old dryers - rubbing your hands together for 30 seconds to dry. The Airblade 'scrapes' the air down off your hands like the high powered dryers in car washes. Start putting these dryers in restrooms and people will start using them over paper if they are conservation conscious. But we were here for the food. I apologize for the poor quality pictures taken with my Blackberry. We started with crab cakes for my nephew, a scallop satay skewer for myself, and dad ordered the Green Papaya Salad - Shredded green papaya tossed with peanuts, fish sauce and herbs in a lemongrass dressing. 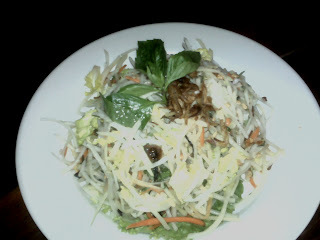 None of us had had green papaya before and we found this to be crunchy and refreshing. I liked the lemongrass and mint that stood out in the flavoring. The salad was huge and we ended taking half of it home. We were all sharing our choices family style. 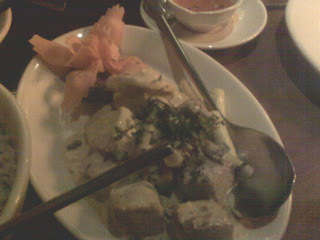 I chose the Tuna Manada - Seared ahi tuna cubes in a coconut milk sauce infused with lemongrass. This was the most disappointing of all our dishes. It was on the bland side and seemed to me like they forgot an ingredient to give the extra punch it needed. Even salt would have brought out the flavors in a better way. It was just dull. Dad's choice was the overall favorite. 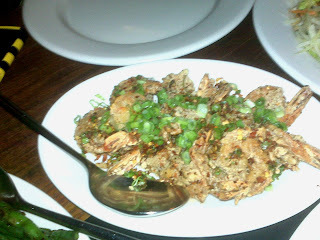 He chose the Salt and Pepper Prawns - fried prawns tossed in salt, green onions, and red pepper. Now I often eat this dish when we go to work lunches at Sacramento Chinese restaurants. This was the best version of the dish I've ever had. They were generous with the pepper and the prawns were perfectly fried, crispy, without any grease. I noticed that they used red pepper flakes for their pepper while in Sacramento we've always had it done with chopped, fresh jalapenos. Both ways are good, but this won out for the intensity of the pepper. 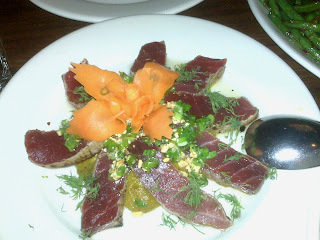 Paul's favorite is the Hanoi Tuna - Sashimi-grade ahi tuna marinated with shallots, garlic, and turmeric, seared rare and served with almonds, dill and scallion oil. He particularly likes the almond paste that you see underneath the tuna. I enjoyed it as well - but second best to the prawns. We also had the Chinese green beans and I got their raspberry ginger ale to drink. The menu has two prices for the items - small and large. We got the large sizes of all our entrees and were glad we did. Even if you were eating the dish to yourself, you will probably want the larger portion. Service was attentive and friendly. I'll probably continue to stop by Wild Ginger each time I visit the Seattle area.